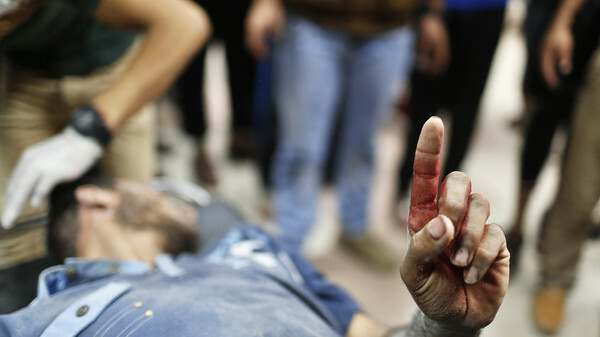 A Palestinian man, who medics said was wounded by Israeli shelling, raises his finger as he is brought to a hospital in Gaza City. An Israeli minister said Thursday that a pullout of troops from Gaza was not imminent and that Israel’s army would continue hunting Palestinian tunnels under any humanitarian truce. Global efforts have been underway to achieve a ceasefire between Israel and the Islamist Hamas group after 17 days of fighting that has so far killed around 700 Palestinians and 32 Israeli soldiers. Two Israeli civilians have also died. “I do not see a ceasefire in the coming days where the IDF (Israel Defense Forces) leave,” Science Minister Yaakov Peri, a former security chief, told the Walla news site, adding that troops needed more time to complete their mission of destroying cross-border tunnels used by Gaza-based fighters. A ceasefire proposal by Egypt suggested that fighting could be suspended during the Muslim Eid al-Fitr celebration early next week to allow aid in to the besieged strip. Some officials voiced optimism that a limited truce may be within reach. Palestinian official Saeb Erakat said Wednesday he expected a truce between Hamas and Israel to begin in a matter of hours, or Thursday at the latest. A few hours later, Hamas leader Khalid Mashal said he rejected a ceasefire with Israel before the lifting of the eight-year-old blockade of Gaza. Mashal, in a televised speech aired Wednesday, also praised the “heroism” of Palestinian fighters facing the Israeli Army in Gaza, saying that the Palestinians are “stronger” than their enemies. “We kill their soldiers, they kill our civilians,” the Hamas leader said.